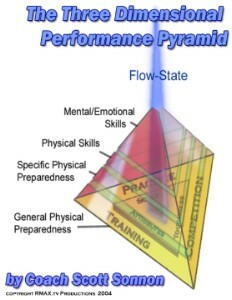 Development of the 3DPP: Performance Diagnostic Trinity and the Training Hierarchy Pyramid. General Physical Preparedness, Specific Physical Preparedness, and Incremental Progression. Flow State and the Hard Work – Soft Work Continuum; Static, Fluid and Dynamic Drills. The Three Approaches to Martial Arts and the Neuroendocrine Response. Stress Levels and the Nature of Expertise. Practice and Competitive Faces of the 3DPP. The Flow State Performance Spiral, the Awareness Dome and the Vortex. Regardless of the martial art or combatives you practice, The Three Dimensional Performance Pyramid will help you attain higher levels of ability at an accelerated pace. Become able to apply your skills whenever you need them, even under high stress levels. This manual belongs in the library of any combat enthusiast, and is complemented by the 2-DVD Softwork set and Integrating Structure DVD. All three resources are provided in the complete Softwork Package.